Looking for “Fun things to do” in the Downtown Appleton area? The Social Station is it. No matter what the occasion, there is a tour theme to fit the needs of your group. Book today, bring your own beer, ice, favorite playlist, and experience the sights and sounds of the city with us. Tours are 2-hours in length and come with a trained tour guide. Most of our tours have a planned route with 3-4 stops. Pub crawl......... Yes! There is no shortage of bars and pubs in downtown Appleton. Take a tour with us, bring your own beer, and we’ll stop at 2-3 local bars and pubs along the tour. If you’re lucky, there may be a couple of drink specials along the way. There are plenty of sights to see and places to stop at that don't include bars. The city has a variety of beautiful murals, museums, parks, art galleries, boutique stores, and coffee shops. You can even mix in a photo scavenger hunt. A fun experience for kids and family. Great for spin classes and boot camps that want a change of scenery or just a unique exercise experience. Join us for this tour as we spend most of our time on the Mega Cycle. We may stop at the local park for some circuit training, a quick stretch or yoga session. Party planning isn't always easy. Especially as it relates to keeping your group together. If you're looking for the perfect party, book your event with The Social Station. Our unique experience provides exercise, entertainment, camaraderie and sight seeing all in one place. Whether you're celebrating a birthday, graduation, business event or family reunion, it's fun and easy for all ages. "We had such a fun time on the social station... You can create your own playlist which plugs into the social station's speakers. Sing at the top of your lungs and wave to the onlookers. You'll feel like a celebrity." Pub crawl without the crawling! Cruise downtown Appleton in your own rolling pub. Bring your own beer, your friends, some great music, and enjoy a night on the town. It will be a night you will remember for years to come. Stop at a few of the hottest bars and pubs in Appleton. Pedal around downtown turning heads in a 15 passenger four wheeled bicycle! There is no way to go bar hopping in the Fox Valley quite like rolling in the Social Station. "It was way more fun being on the pedal pub with all our friends & our own music than just regular bar hopping. We will be doing this again!" We know there is a strong correlation between employee retention and the quality of team relationships which is why we host dozens of team building events each year. From big corporations to family owned businesses we believe "fun" can motivate and build morale. 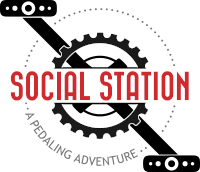 With 10 pedal stations and 5 non pedal stations, the Social Station can cater to any group and provides a leisurely experience to people of all abilities. It's time to mix it up. Ditch the bowling alley or the park and do something fun that will have your team talking for weeks. Pro Tip: Ask about mixing in a photo scavenger hunt. "Our company had a blast with the Social Station as a team bonding event! Would highly recommend!" Appleton has enjoyed a rich history since it's founding in 1853. Pedal the beautiful downtown with your friends. Discover some of the many hidden gems in our historic city through one of our themed tours. We take our customers to only the best pubs, restaurants, parks, galleries, museums and the many other amenities our city has to offer. "Went last night with a group of neighbors and absolutely had a blast! Dan our tour guide was fun and entertaining all evening! Definitely recommend to anyone looking to have a night full of laughs and great memories!" A great way to experience the Social Station without stopping at bars. There are plenty of sights to see. The history here dates back to the early 1800's and the arts & culture scene in Appleton is budding. The city has a variety of beautiful murals, museums, art galleries, boutique shops, and coffee shops. Our adventure started with a 1.7 mile ride to our lunch destination, up hills, around corners, and downhills. I think it’s safe to say everyone enjoyed the downhills the best. Are you on the verge of marriage needing a night to celebrate before you tie the knot? Turn heads and create a night to remember as you roll downtown Appleton with your squad. Grab your entourage, some beer, pick some tunes, and cruise downtown while, of course, stopping at the hottest bars in town. "Incredibly fun evening... awesome bachelorette bash. Music playlists galore! Others on the Avenue joined in and took pics and celebrated right along with us!" We all have a little rebel in us. We have provided custom pedal tours such as the ones below. Sunday Funday – Mimosa and brunch with friends. Everyone! Appleton pedal tours on the Social Station are the thing to do. Curious about how to get ready or where things begin and end? You can find all the answers on the Prep page and the FAQ pages.